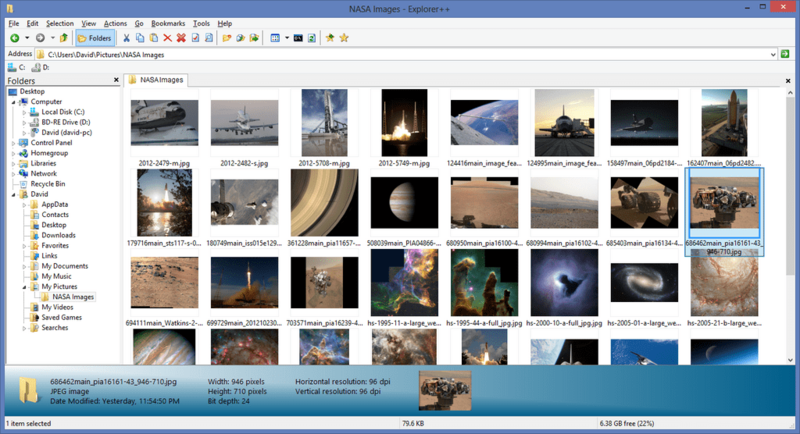 Explorer++ is a multi-tab Windows Explorer replacement, featuring image preview, keyboard shortcuts, customizable user interface and advanced file operations (merging, splitting) etc. Alternatively, Explorer++ Portable adjusts paths and automatically switches between 32 and 64 bit. The 'Open in New Tab' menu item was not always been added to the folder context menu. Fixed. Previously, file times could not be set for a directory using the set file attributes dialog. Fixed. A UTF-16 LE BOM is now written when pasting text (as a file). Information will then be saved to Explorer++.log, which will be created within the same directory as the executable. Its a nice program, and fairly easy to use. However, I've found one small bug as soon as I tried it. When you go into the "Organize Bookmarks" section, there is no SAVE feature, and none of the changes seem to take effect until you close the program and restart it. I love it. Great software! The only two things I have a problem with is the slow network speeds and that it uses the default windows copy even when I replaced it with something like TeraCopy. works great in windows pe environment ! thats all i needed it for. Looks great and mostly works very well. At this stage I cannot copy and paste emails directly from Exchange to any folders. Interestingly I can copy the mail to my desktop then to folders. It will need a preview window in a next update. The preview in the botton bar is not a good idea, it must be resized and rest many windows sapace, a botton resizable lateral window would be fine. If you create the config.xml file yourself, your settings would NOT be saved by the program. There is an option to run the program in portable mode under Tools => Option => General. Check the that option and the program would run in portable mode. 1.0 rc1 is not mentioned on the title page, but it is on the download page, and is accessible through the forum. I have given up using several of what are known as "orthodox file managers" (including Directory Opus even though it wasn't free) because I just like this better. This is simply fantastic. The best Explorer replacement I could find (and I've tried them all). There are still some things missing at this point, but they'll be added. I think it's great. I use 'FreeCommander' as well because it has a dual pane and some other features, but Explorer++ is nice to use. - Copy (Ctrl-C) doesn't work (send things to Clipboard) in the Folders box. This is the first Explorer replacement I've used that feels like Explorer, improved. Most don't feel right. It seems to work nice. But it is rather slow on network drives.